During robotic surgery, however, the robot is at the center of the room. The surgeon is in a corner, head immersed in a console. The rest of the medical staff is scattered, usually unable to see each other's faces and unoccupied for long stretches. Cornell researchers took a close look at the impact of that arrangement in a new paper, "Operating at a Distance – How a Teleoperated Surgical Robot Reconfigures Teamwork in the Operating Room," presented at the ACM Conference on Computer-Supported Cooperative Work and Social Computing, Nov. 3-7 in Jersey City, New Jersey. "The robot influences aspects of the teamwork and maybe makes it more difficult to work as a team," said lead author Hannah R.M. Pelikan, formerly a Cornell visiting scholar in the lab of Malte Jung, assistant professor of information science and a co-author on the paper. "They definitely have to do more things to overcome the challenges brought by the robot, and they need to develop new strategies." The researchers spent two years interviewing medical staff and observing surgeries in two U.S. hospitals using the Da Vinci Surgical System, a large robot with several arms equipped with surgical instruments and an endoscopic camera. They video recorded more than 50 hours of surgeries performed both with and without the Da Vinci – the world's most popular surgical robot, controlled by the surgeon via joystick and used in 877,000 surgeries in 2017. The Da Vinci has been credited with greater precision, better vision and a reduction of the surgeon's cognitive load and physical fatigue, but no previous study examined the distance it creates within the surgical team. The researchers identified two forms of distance: cognitive, concerning how the team collaborates and communicates; and affective, which refers to feelings of emotional disconnectedness. "Coming in with the understanding that social dynamics in teams is really important, I was struck by how the engineers in that context thought about surgery purely as the mechanical task of cutting and joining tissue," said Jung, who is also the Nancy H. '62 and Philip M. '62 Young Sesquicentennial Faculty Fellow. "What happens if you take a crucial member of the team, the leaders of the team, and stick them in a box?" In open (nonrobotic) surgery, surgeons often used a single word or hand signal to indicate what they needed, but in robotic surgery, where most members of the team couldn't see each other, everything needed to be said out loud. Robotic surgery team members communicated like airplane pilots, giving verbal instructions and verbally confirming them. "You're pushing, right?" a male surgeon asked at one point, and the first assistant replied, "Pushing, Sir," both acknowledging the question and inserting the "Sir" to indicate the end of the sentence. In open surgery, members of the operating team tended to be highly in tune with each other's moods and emotions – a necessity when performing such intricate and high-stakes work. But the robot made it more difficult to gauge feelings, Pelikan said. "In the operating room they really have an eye for each other, they really notice if someone's not feeling well, they see things before you even speak up," said Pelikan, who plans to begin doctoral study at Linköping University in Sweden in November. "With the robot that's more difficult." The surgeon's assistants were needed less frequently in robotic surgeries, sometimes leading them to chat among themselves or become occasionally distracted. Those chats could also cause mild stress for surgeons overhearing conversations going on without them. One surgeon told an interviewer he feels "lonely" operating at the console apart from his team. Teams tended to compensate for this kind of affective distance in large and small ways. During open surgeries, the surgeons generally left as soon as the operation was complete. 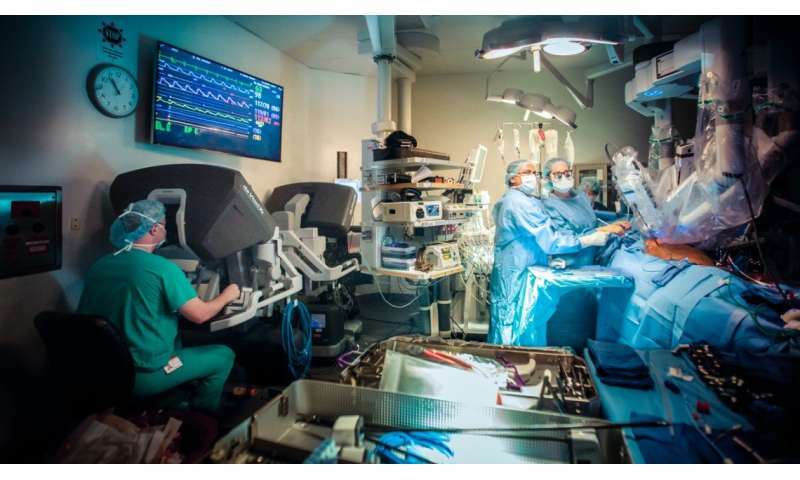 In robotic surgeries, however, surgeons often joined the others for what researchers called a "huddle" after the procedures, chatting and joking and sometimes touching. "We could already begin to see the incipient generation of new surgical rituals that were being invented in response to the kinds of challenges we describe," said Steven Jackson, associate professor of information science, who also co-authored the paper, along with Amy Cheatle, a doctoral student in science and technology studies. The researchers hope that thinking about surgery as a collaborative task, and considering how all the team members are affected by the robot, could eventually impact both how machines are designed and how humans use them. "How might we imagine and practice design differently if we design for teams and settings and context, as opposed to individual single users?" Jackson said. "Whenever we see human-robot interaction working successfully, it's because there's a long, careful and artful mutual adjustment of the technology of the robot in the particular social settings in which it's deployed."